The next chapter in adidas Consortium’s Ultra Boost Collective is a collaboration with Paris-based brand Études. First to drop is the Ultra Boost, a star adorned, bright blue Primeknit constructed shoe. The blue Primeknit upper features a cage-less design and a sock style collar around the ankle. 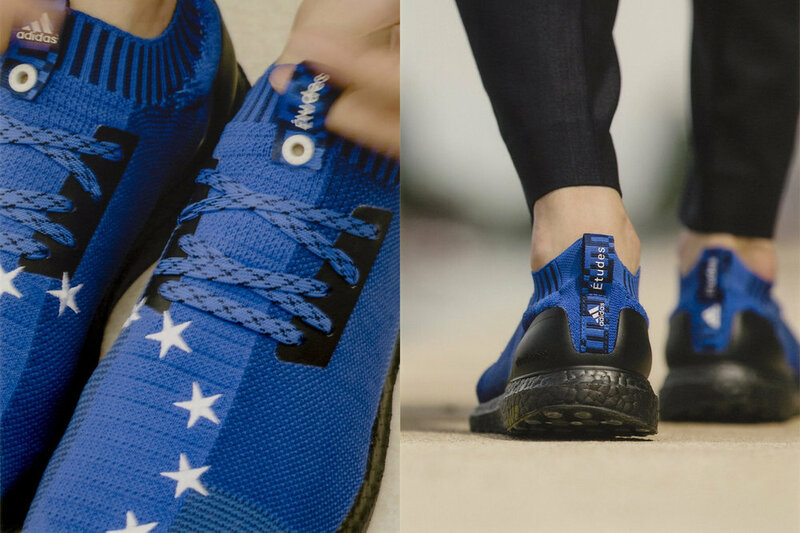 Blue laces are run through the knit upper, while Études flies the flag and adds the stars of the European Union across the front toe. A black heel cup, blue heel tab, and black full-length Boost midsole completes the look. Partnering up with the statement runners is a translucent rain cape. Minimalist in its design language, the jacket has no colours, prints or patterns and instead provides a subtle co-branded style as its main focus. This latest Ultra Boost will be available first through the Études store in Paris on September 8, before a global and online release on September 15.